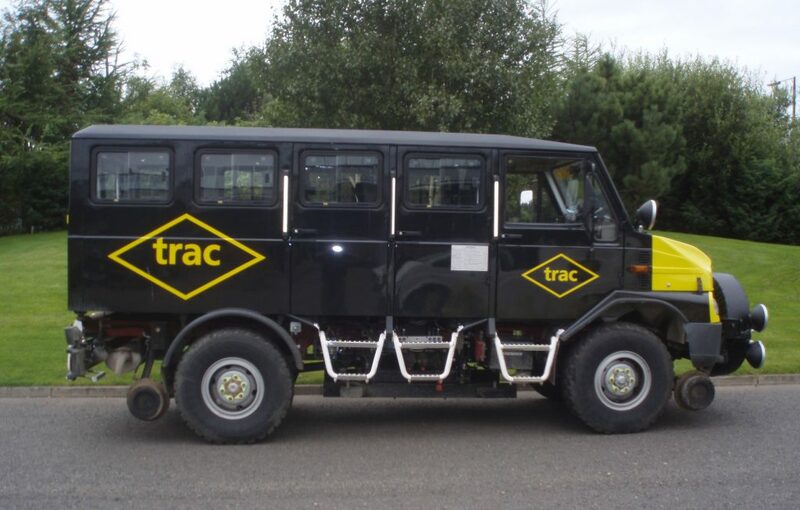 TRAC’s Bremach Crew Bus combines the strength and adaptability of the Bremach vehicle with a rail guiding system developed by LH Access Technology. The result is a multipurpose road rail vehicle offering outstanding performance both on and off the track. With the ability to carry up to 13 personnel; the Bremach plays an integral part in any Rail project allowing easy transport to and from worksites. The high friction value between the rubber wheels and steel rails creates high traction force and superior braking efficiency. This, in addition to the tubular chassis design used on Bremach vehicles, enhances the safety performance and reliability of the Bremach Crew Bus. The ability to transport personnel along the rails to the worksite increases the flexibility of access points, reducing time and eliminating access problems. The turntable allows the vehicle to turn 180° on track, allowing travel back to the access point in the forward direction. The PTO shaft at the front of the vehicle offers the potential to attach various pieces of de-vegetation management equipment, increasing its flexibility and workscope.